Raymond (Ray) Seaman, 85, a resident of Kaysville, Utah, passed away peacefully on February 11, 2019. Ray was born on July 26, 1933, in Guys Mills, Pennsylvania. He was the eldest son of William and Ruth (Luzier) Seaman. Ray was a brilliant and ambitious young man who grew up in a farming community, studied electronics as a hobby, and pursued a love of flying with his favorite cousin Howard Graham who owned a private airplane. Ray graduated number one in his class, with a Bachelor of Science degree in electrical engineering, from the Pennsylvania State University. 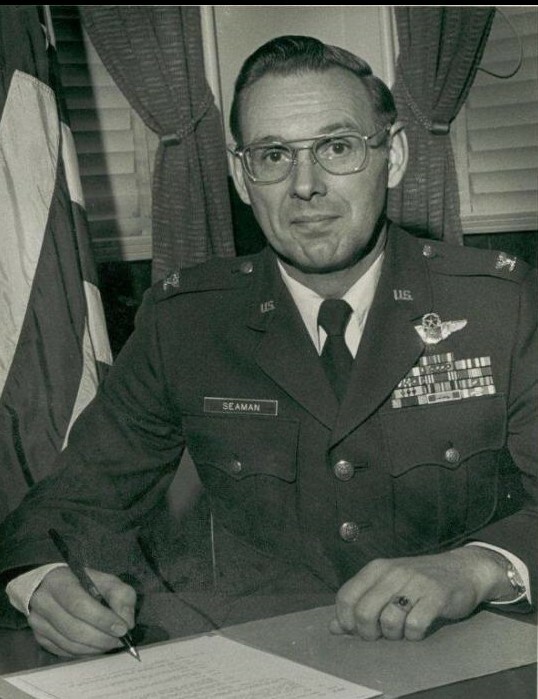 He entered the U.S. Air Force through the Aviation Cadet program and served our country valiantly in a number of different combat aircraft types. He married Janice Seaman, and together they had two children, Calvin and Sherri; and Ray was always very proud of their accomplishments. Ray and Janice were later divorced, and after he retired from the Air Force, he worked for the Unisys Corporation in Salt Lake City, Utah as a Program Manager. There, he met Geraldine (Jerry) and they were married in June 1990. Ray and Jerry thoroughly enjoyed retirement while traveling in their RVs, and exploring Lake Powell in their boat the “J. L. Seagull.” Later, they spent winters in Arizona, and summers in Utah enjoying gardening and family activities. Ray was always very supportive and willing to serve as Grandfather and Great-Grandfather to all of Jerry’s extended family. He will be sorely missed as the most kind, generous, loving husband and father. A memorial service for Ray will be held on Saturday, April 6, 2019, at 1:00 PM at the Russon Mortuary in Farmington, Utah.